Darker With the Lights On. In some of the stories we are immediately presented with bizarre or extreme situations — “My name is Leckerdam and this is how my children killed me” begins ‘Leckerdam of the Golden Hand’ — but ‘Lights’ begins with a believable enough premise, even if one could wonder exactly why May and Michael are so keen to get the crate outside the door (and couldn’t a neighbour come over and help?). Nevertheless, the story becomes decidedly stranger when they begin to dance, and of course turns fully surreal when the sides of the box fall away to reveal the childhood scene that seems to provide the story its climactic moment: Michael reaches to switch off the lights and May tells him, “It’s darker with the lights on” in the brief denouement — and it is one that surely invites an allegorical reading. Is this a story about the passage of time, the melancholy of remembering as this couple nears death, invoked though dreamlike distortion? Such an interpretation seems to fit, but what does that final line contribute to it? Most immediately it would seem that Michael wishes to bring on the “darkness” in response to the distress caused by the scene confronting them but is prevented by May, who sardonically observes that the sight itself retains its own sort of darkness. 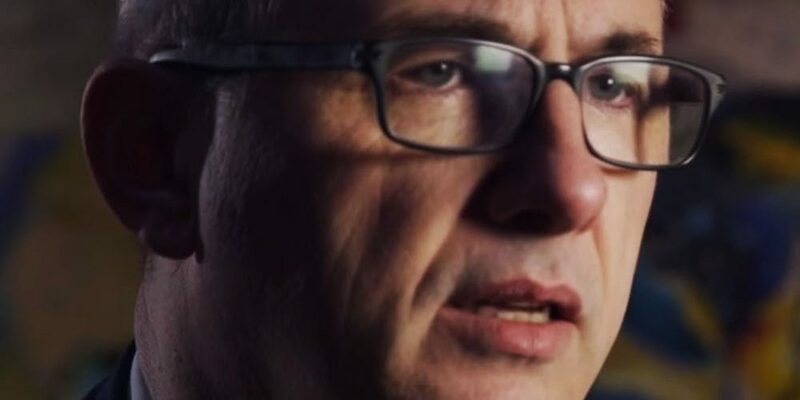 Yet there seems to be a calmness about May — who, Michael tells us, “put her hand on mine, gentle, warm” — that belies the assumption that “darkness” is something to be avoided, as if she in fact wants the light to “see” the darkness. But perhaps approaching the story effectually requires that we ponder the various connotations of “darkness” in this context. 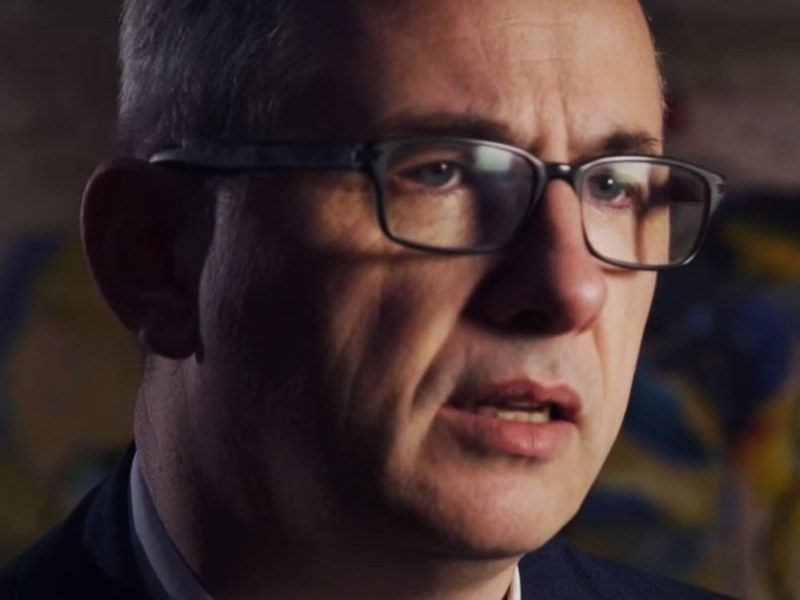 If Michael is seeking the solace of darkness when the light reveals too much, May encourages him to face the darkness as the true locus of reality. And if it is indeed darker with the lights on, then darkness itself must have its own kind of light, unless the distinction between the two simply collapses and darkness subsists within the light, erasing all differences in a general scattering of meaning. Which may, in fact, be the effect Hayden ultimately hopes to achieve: the paradox remains a paradox, the moment one to puzzle over but not to resolve in a conclusive interpretation that reduces the story to a fable-like allegory (however brief) that has discernible “sense” to be made of it. Clearly enough the story evokes a ruefulness about ageing and the loss of potential, but to go beyond the story’s way of evoking it — its formal and stylistic attributes — in order to subsume what the work does to what it means is to deliberately overlook the manifest qualities of the work itself, substituting some available paraphrasable point. But perhaps it could be said that the story in effect lures us into making this move, subsequently thwarting our attempt to find the “right” formulation of that meaning — and provoking us to consider why we are so eager to resort to this interpretive tactic in the first place. It seems to me that the presuppositions animating ‘Lights’ are the presuppositions at work in the book as a whole, which more than anything else brings aesthetic unity to its various parts. Not all of the stories proceed exactly as does ‘Lights’, which in its scenic compression is especially effective in creating a kind of ersatz allegory. But all of the stories do seem to exist in an in-between state that, though askew from what we would consider ordinary reality, still seems to bear on that reality (many of the settings — trains, restaurants, dinner parties, the beach — are ordinary indeed) in an indirect way which might still be brought to a kind of sense. We might preliminarily call this atmospheric quality “dreamlike”, but while many of the stories do exhibit the associative logic and allusive distortion of dreams, to settle for this characterisation in accounting for Hayden’s effects is to be imprecise in describing their structure and their mode of representation, as well as rather nebulous about how a narrative modelled after dream imagery would in fact actually work. The same is true of the invocation of the “unconscious” as the possible source of the stories’ underlying method of representation. In each case, Darker With the Lights On evokes a filtering and transmutation of everyday reality, but these stories are at once both more purposeful and less insistently symbolic than dreams, more cogent than the Freudian unconscious, but less determinedly elemental. I began to observe the office building as if for the first time: the honey-coloured glittering skin of stone, the terracotta panels, smooth and grooved; the sheets of clean glass. My eye and mind moved with delight from the detail to the great mass of the building and back again. I felt joy to be outside forever. The unbothered, even ecstatic, tone of the protagonist’s narration only heightens the story’s aura of unreality, which originates in a literal flight of fancy but subsequently sustains the fancy in a way that is quite deliberate in its effect. The “jumper” at first seems surprised that he is not falling towards the ground — or at least falling faster: “I could see that the ground was farther away from me than I could have expected it to be and, what is more, seemed to be receding faster than the rate at which I was falling.” Night soon arrives, and the next morning our floating man begins to adjust to the situation (with no choice but to do his toilet business where he floats). He appears to enter into a timeless zone of sorts, as the scene below him seems to proceed through all four seasons in a single day. Time quickens further, its manifestation below suggesting perhaps a cataclysmic event, and the protagonist experiences an accelerated descent — “I find that I have dropped many floors and that the ground is coming up fast” — as the story concludes. Perhaps we could say that ‘Egress’ invokes an elemental fear of falling, but it turns this potential nightmare into a seemingly whimsical fantasy more likely to disarm than to distress, only to reassert at the end the anxiety that the story has partially defused. Like the protagonist, we are left “hanging” at the end of the story, but the repetition in the final short paragraph of the lines with which the story began gives ‘Egress’ a kind of aesthetic symmetry that takes it beyond the act of mimicking a dream. The sort of irreality inherent to dreams is used as the fictive means to question our preconceptions about the logic and purchase of dreams, while instead incorporating the irreal in an entirely aesthetic strategy that doesn’t attempt to reinforce their ambient symbolism. This aesthetic strategy is perhaps most radically expressed in ‘Golding’. This story certainly at first reads like its narrator’s account of a dream — in fact an almost endless procession of them, each morphing into the next from the perspective of a narrator without identity or even a stable gender. But, the narrator tells us, “There were no dreams. All happened. Senses came from nature but not sense, cause but not action, time but not story. There was only this voice. This, her telling.” The story is indeed strong on sensory detail — often taken from nature — but less concerned that those details add up to ultimate sense. It is extended to sufficient length that a series of actions do seem to take place, but they certainly do not connect in a way that could be called a story — the actions are resolutely linear, but seem only momentarily related, and could hardly be said to rise or fall. “Voice”, the uninterrupted telling, is certainly what leaves in ‘Golding’ the deepest impression. The transformations the narrator chronicles spin out imagery to be assimilated for their immediate, dynamic expression, not for their ultimate integration in an achieved unity of effect. Numerous stories in Darker With the Lights On proceed in the way that ‘Golding’ notably exemplifies. ‘Memory House’ extends its initial conceit that the narrator’s “memory house is my mind” by doing a kind of inventory of the household items stored there, effectively blurring the distinction between “house” and “mind” as the dodgy qualities of the latter distort the former. ‘Remains of the Dead World’ depicts an old man named “Dada” speaking to a crow (and sounding more like a child than an old man) “in a dark declivity at the heart of a wood.” The story’s absurdist, fabular premise seems to draw on both the surrealist movement for whom perhaps the old man is named and Native American folk tales, although it is a fable that actively denies a “moral”. As the story nears its conclusion the old man asks what will happen next, to which the crow replies: “The seasons go on for ever and ever until the sun dies.” ‘Limbed’ follows a man as he travels to what in effect turns out to be his own execution by means of a gigantic axe (apparently autonomous) tearing everyone in the vicinity limb from limb. Other stories in the book are less purely surreal, more recognisable in scene and situation (if still plenty weird). ‘Hay’ concerns a man named Andy, who is hired to stop the workers in a mine from flooding the works with their tears. He manages to mitigate the effects, but does not ultimately succeed in stopping the miners from crying. ‘Cosy’ is the closest thing in the book to realism, telling the story of a day in the life of George, who performs all of the ordinary actions of such a day (eating breakfast, napping), but suddenly at the end of the story says to Edith, who has just arrived: “I long for the suffering to end.” Immediately after, “laughter streams out into the close air,” but we don’t know whose. 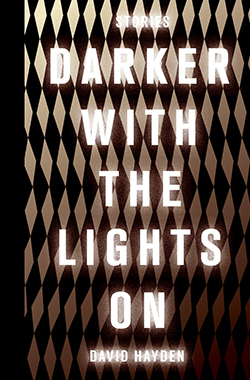 Several of the stories seem to be, to a greater or lesser degree, if not exactly metafictional, certainly concerned to suggest connections between the notions voiced by the characters and the artistic approach taken in Darker With the Lights On. ‘How to Read a Picture Book’ depicts “Sorry the Squirrel” as he performs before a group of children, contrasting pictures and words: “A picture of an elephant means an elephant. … Words are just mute smudges until you know what they mean, and when you put them together they can tell all manner of things. You can fall through words down into a seething belly world of billions of objects and notions all shrieking and hiding.” ‘Play’ features a lecture by a professor who stresses the importance of play but who insists: “Play is not fun. It’s about what we must do to live. … Our smiles are grimaces.” In ‘Reading’, one of the characters proposes the theory that the human afterlife consists of waking up in the book we are reading before death. Whether this is something to be anticipated or avoided is not finally determined. 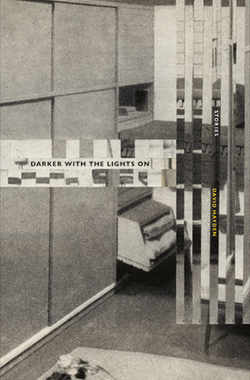 That Darker With the Lights On is itself both playful and grim, adept in language yet also at times seemingly tumbling through a “seething belly world”, perhaps helps to explain why the book hasn’t received as much attention in the United States since its publication in 2018 as it had previously in the UK. There are in fact numerous current American writers employing versions of fabulation and surrealism, but few of them are as relentless as Hayden in following out the logic of the surreal in order to in effect achieve its own undoing as a distinctive “strategy” pursuing definable ends. Hayden’s stories evoke situations that might promise whimsy, or a “quirky” social satire, but consistently prove elusive in their resistance to interpretation, refusing if not negating the expectation that a work of fiction will ultimately yield up its exegetical secrets, however obliquely. Daniel Green is a literary critic whose essays and reviews have appeared in a variety of publications, both online and in print. His book, Beyond the Blurb, is published by Cow Eye Press. He blogs regularly at his website The Reading Experience, and tweets @greenlitcrit.